The new year is coming up fast and with it are the newest trends in everything. Anyone looking to update their flooring for the new year will be happy to know that 2015 is bringing with it some exiting new trends in hardwood flooring. There are so many different choices that everyone is sure to find something that is appealing. 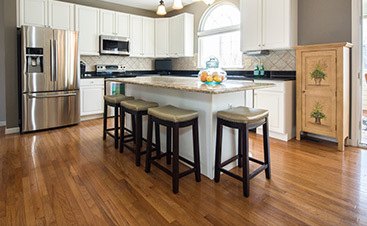 Gray may seem like an odd choice for a floor color, but this year it’s a preferred option. Gray is a neutral color so it’s quite versatile. Plus there are so many different shades of gray that it fits in with any décor. Whether a home is traditional or contemporary, a gray floor is a great base to build a room around. The trend of matte-finished floors started in Europe but has made its way across the pond. Matte-finished hardwood floors have many advantages. They provide a feeling of warmth and comfort to a home. Further, since they have no glossiness, matte-finished will easily hide imperfections such as scratches and dings. They are also great for hiding dirt and fir, so they are a top choice for homes that have kids and pets. Exotic hardwoods such as bamboo provide a home with a unique look that can’t be achieved from traditional hardwoods. Exotic hardwoods tend to have nontraditional colors and grains so they are ideal for homeowners who want to make a bold statement with their flooring. Further, even though a material like bamboo has been a popular floor choice for quite a while, there are currently some updated looks for it. Bamboo is now coming in a wider variety of colors and styles. Bamboo is also being engineered to be even harder than before. Classic looks are timeless, and this year they are trendy as well. Adding a bold accent to a classic hardwood floor creates a dramatic contrast that is both visually appealing and inviting. A good example of a classic look is using reclaimed wood as a flooring material. 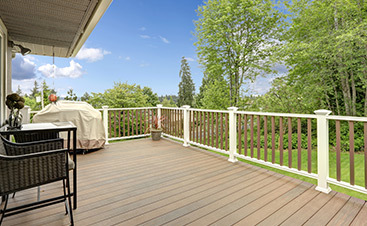 Salvaged wood can be expensive, particularly when it is used to cover an entire floor. However, there are new factory-finished options that give the same effect as well-worn wood. An added benefit to the factory-finished variety is that it is much more able to withstand moisture and humidity. Cork floors have many positive qualities. It is more comfortable to walk on than traditional wood floors. Also, cork floors create a pleasant acoustic environment. 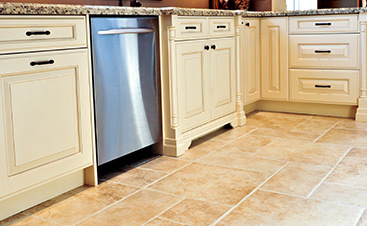 Although past criticisms of cork floors have been their lack of durability and color choices, that is no longer the case. Modern technology has made cork floors stronger and there is a wide array of colors available for cork as well. Buying American is always fashionable, even for hardwood floors. Exotic woods that come from the other side of the world can be expensive and once the wood is here, not much is known about the forests from which it came. Woods that are native to the United States are more sustainable because the forests are replenished as the trees are cut down. So, thanks to a push to “buy American” along with people’s desire to be ecologically conscious, woods such as oak, hickory and maple are all back in vogue.